Don't have room for a tree? Just because you live in a small space, doesn't mean you can't deck the halls. These decorating ideas will get your minuscule dwelling in the holiday spirit. This elegant wreath tutorial by Freckle and Wulff will add a pop of holiday cheer to your living room wall. To create, you'll need a mix of seasonal foliage. This tutorial features eucalyptus branches and holly leaves intertwined with sprigs of baby's breath and dried cotton stalks. Life stunk so much during the Middle Ages people had to carry a small aromatic container called a pomander to hold up to their noses to avoid offensive smells. Nothing merry about that, right? These days, a pomander usually refers to a clove-studded orange. It is a traditional sweet-scented holiday ornament anyone can make. Pam from House of Hawthornes says you do not have to stick with oranges. Her tutorial features clementines. For years ​IKEA sold Christmas tree fabric panels that featured a life-size image of the real thing. They were perfect for tight spaces that couldn't fit a traditional evergreen. Unfortunately, the Swedish megastore stopped selling them — wah-wah. Good thing, Lucy from Craftberry Bush created a wall tree DIY that Bob Ross (yep, The Joy of Painting) would love. You'll need a canvas drop cloth and a few painting supplies to get started. Here's the tutorial. Nothing says happy holidays like a seasonal pom-pom wreath. Kellie from Nest of Posies added some extra eye-catching texture to her decoration using ball fringe and felt flowers. Her tutorial explains how to layer using hot glue. While it's tempting to buy a biggish evergreen and then load it up with a ton of ornaments, a smallish option that's minimally-decorated won't cramp your pint-size living room. Caitlin and Manda, the best buds behind one of our favorite décor sites, The Merry Thought share alternative holiday decorating tips for small trees. Looking to replace your fresh cut, evergreen tradition with something that's not made of plastic? You can decorate like a Scandinavian this holiday season with this wooden dowel Christmas tree tutorial by Vintage Revivals. After you stock your bar cart, boho décor blogger, Kimberly Duran says, don't forget to decorate it with string lights, garland, and of course flashy gold tchotchkes. See how she styled her quirky swan-themed bar cart on her blog, Swoon Worthy. When you unwrap your holiday gifts, don't toss those adorable ribbons. Next year you can use them to create this cute upcycled mini wreath. Jessica and Mandy, from Little Birdie Secrets, explain how to make. Here's another easy project from the ladies at The Merry Thought. They used pine branches plucked from their yards to make strands of wreath garland. You can follow their lead using any bendy stem or branch you fancy. We're using rosemary. Here's the DIY. Cleaning up pine needles is a prickly chore. But what if you can't channel the holiday spirit in your small space without a real evergreen? Kendra from Kit and Forage came up with an aromatic solution. 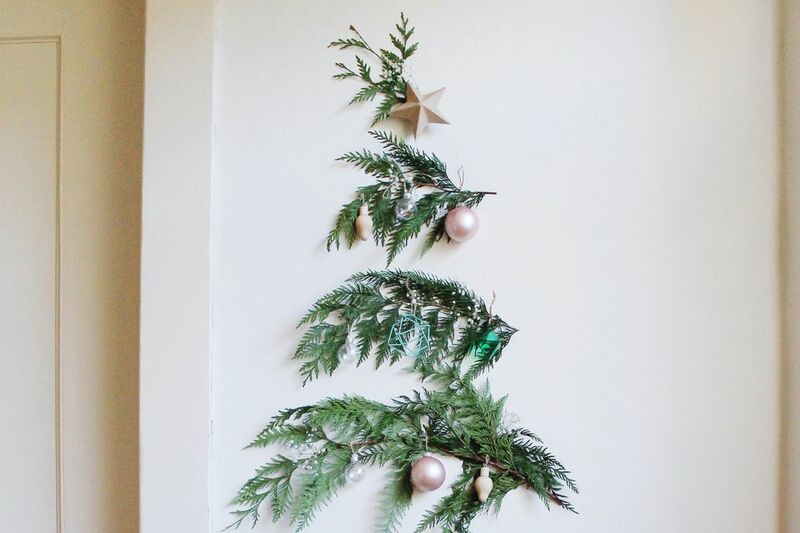 To keep the needle mess to a minimum, she hung several fragrant cedar branches to create a cute Christmas wall tree. Here are her tips. A pegboard creates a spot to hang stocking when you don't have a mantel. Rachel from The Ordinary Lovely added one to her living room wall. Each month her family pegs a different display. Here are her tips. Turn those Amazon Prime shipping boxes into something wonderful like a Christmas tree doll house. You'll find the tutorial on Mr. Printables. The merrymakers at Beaucoup put presents to work as holiday décor. See how they dressed up this bar cart for an ornament making soiree. We adore their paper light bulb decorations that fold flat for easy storage. Marij Hessel from My Attic shares how to whip up a custom holiday display for less than $20. To get started, you'll need a set of clear glass ornaments. You can pick up a dozen for around $10 at most craft stores. Afterward, fill each one with something eye-catching. Think sparkly glitter or colorful candies. Marie reached for an assortment of Christmas greenery. Here's her tutorial. Don't have time to decorate? Turn on the Yule Log. This time of year nothing makes a home feel cozier than a crackling fire. But you don't need a house with a hearth to enjoy watching a couple of logs burn from the comfort of your sofa — That's if you have an internet connection. For the last few years, sites such as Watch Yule Log and YouTube (more below) have been lighting up homes with Yule Log cheer. What started this seemingly random holiday tradition? More than 50 fifty years ago, WPIX a local television station serving Metro New York debuted the first broadcast of a log burning fireplace so millions of apartment dwellers could enjoy Christmas fireside. Since that time different local stations across the country started doing the same every holiday season.